I am a total carb-oholic. I love cake, freshly baked bread and I would rather eat a bowl of pasta with butter more than anything in the world. I proudly roll my eyes at any food trends advocated by the paleo, gluten-free and carb-free lovers. And despite my skepticism for gluten-free trends, it is my obsession with pasta that led me to invest in a spiralizer and try out the zucchini noodle craze. I must admit: zucchini noodles are tasty and satisfying. And with both these zucchini noodle recipes below, I never once felt deprived that my carbs had been stolen away. 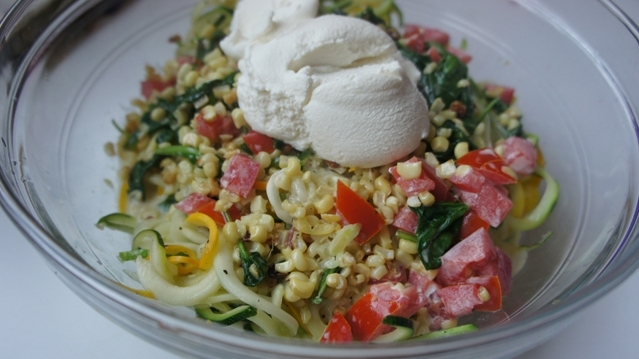 Like regular pasta, zucchini noodles lend themselves to multiple flavors and interpretations. And they can be an easy go-to, even on a weeknight. Last Monday my dad, my daughter and I strolled to our local farmers market to see what was fresh from the farm. I picked up zucchini, corn, tomatoes and fresh ricotta. We went home, threw them all together. And a new dish was born. My zucchini noodle bolognese was actually a dish I made during Passover. We loved it so much my husband and I both ate two enormous servings. The only thing missing? A large hunk of garlic bread. Preheat oven to 400 degrees. Remove corn kernals from cob and spread in a single layer on a baking sheet. Drizzle with 1-2 Tbsp olive oil and salt and pepper. Roast in oven for 10 minutes. In a large saute pan heat olive oil over medium heat. Saute zucchini noodles in 3-4 batches for around 4-6 minutes each, or until noodles are soft but still have a bite. Season with salt and pepper. Place in a colander to drain off any excess water that the zucchini released. Add butter to another large pan over medium heat and melt. Add corn, cherry tomatoes, cream and salt and pepper. Cook until cream has reduced slightly. Add zucchini noodles and toss to coat. Serve with fresh ricotta and fresh basil if desired. 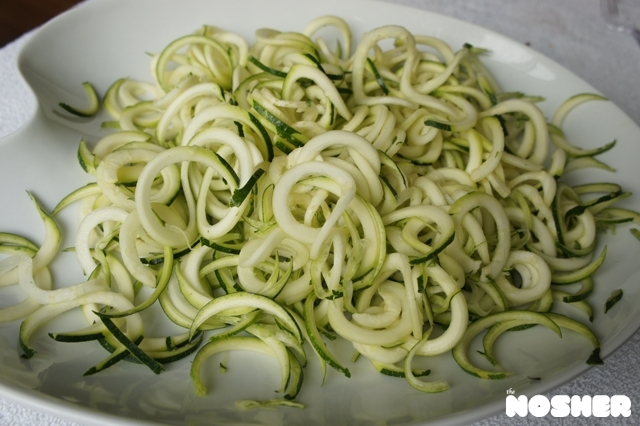 Spiralize zucchini noodles. Set aside. In a large skillet, heat olive oil on medium heat. Add onion and saute until they become soft, around 6-8 minutes. Add garlic and dried basil and cook another 2 minutes. Add tomato paste, breaking up as you go until all paste is dissolved into the onions and garlic. Raise heat to medium-high and add the ground beef. Saute beef, stirring and breaking up meat into small, even chunks. There shouldn’t be any large lumps. Cook until meat is longer pink, about 8-10 minutes. Add crushed tomatoes and red wine and cook over medium heat until sauce thickens. Add salt and pepper to taste. In another large saute pan, heat olive oil over medium heat. Saute zucchini noodles in 3-4 batches for around 4-6 minutes each, or until noodles are soft but still have a bite. Season with salt and pepper. Serve bolognese sauce over noodles. Garnish with fresh basil. Note: this bolognese recipe will make more sauce than needed for this dish. Place remainder in an air-tight container and store in refrigerator or freezer.